We made it! We survived the most depressing month of the year. I might not have done too well on the old resolutions (does one bath cut short by a screaming baby count as self-care?) but there’s still 11 months to go. 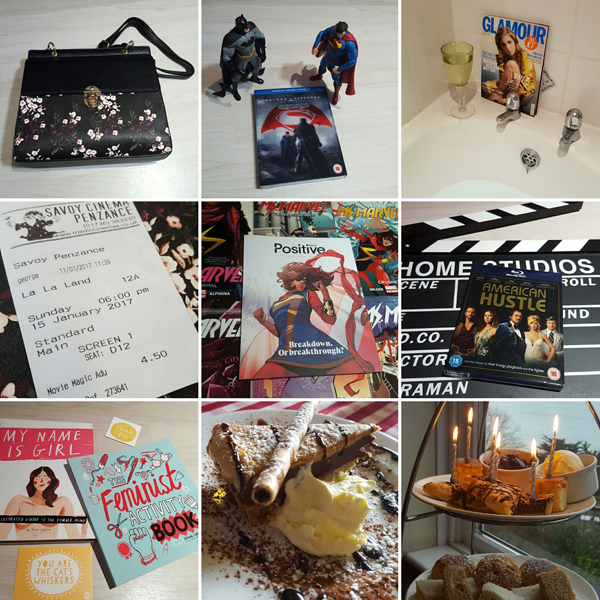 Here’s a look at my month in photos. 1. I was gutted when my handbag broke but I love this little beauty from New Look. It’s big enough to hold the essentials and a paperback for the commute. 2. Luke got an HMV voucher for Christmas so we treated ourselves to Batman vs Superman. Need to find a quiet night to see the extended cut. 3. Ah, my one bit of self-care for January! 4. I saw La La Land with my fab mummy friends and it was sooo good! I’m tempted to go again. 5. I had to buy Positive News when I saw the cover on Instagram. 6. Every now and then you can spot a bleddy good bluray in Poundland. Still haven’t seen this one but I love J-Law and Amy Adams. 7. All of the feminism! 8. I didn’t think I liked peanut butter but this peanut butter and chocolate cheesecake from The Pirate Inn is incredible! 9. I treated my mum to afternoon tea for her birthday. Bleddy lovely it was too. oh afternoon tea sounds like bliss. I want to organise one for my birthday this year. Ooh do it! It’s a great treat.